Gold magnetic vent covers can be used on 4 x 10 metal floor registers to stop unwanted air from being released. Sold in a two pack, these magnetic sheets will look just like your brass floor register. 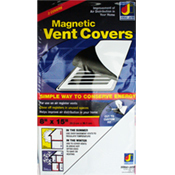 These 4 x 10 white magnetic sheets will block vents that have escaping airflow. Block metal floor registers with this cover which is sold two to a package. These magnetic floor register covers are a great and economical way to increase energy efficiency throughout your home or office. Sold in sets of (3) 8 inch x 15 inch customizable magnet sheets. This sleeve extension for register deflectors works with the baseboard deflector and the the filter deflector. Maximize your energy efficiency by directing warm or cool where you want it to be. Deflect-O model #40 forced air deflector can be used to redirect air flow in your home. Use this product on metal floor registers that are 10 to 14 inches long by attaching with magnetic clips. The premium air deflector is made of a durable plastic an requires no tools for installation. Redirects air to increase the comfort level in your home. This air deflector with a filter traps airborne contaminants providing you with a cleaner environment. Extends from 10 inches to 14 inches to accommodate most register sizes. 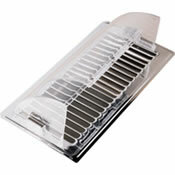 Air deflectors are a great way to improve the energy efficiency in your home for a small price. Deflectors are easily attached to baseboards with magnets; no tools required. Prevent drafty air blowing into your home with these easy to install draft shields. No tools required and they install in minutes. Made of a durable clear plastic. Make your home or office more comfortable by redirecting air where you want it to go. This sidewall air deflector installs with magnets that are provided. Steel Crest Sample Chain Set - For a small deposit of $25.00 we can send out the sample set. Tan plastic floor registers are rustproof and made of high impact polystyrene construction. Suitable for wet areas and outdoor use. These make it easy to divert air flow away from or towards something for ease of comfort. White plastic floor registers are rustproof and made of high impact polystyrene construction. Suitable for wet areas and outdoor use. These make it easy to divert air flow away from or towards something for ease of comfort. Tan 4 x 12 Plastic deflector registers can be used in the floor or wall mounted. These high quality registers are made of a high gauge polystyrene and are sturdy enough to walk on. This register with an air deflector can save you money and improve your comfort. White 4 x 12 Plastic deflector registers can be used in the floor or wall mounted. These high quality registers are made of a high gauge polystyrene and are sturdy enough to walk on.